In a footnote to a previous post I worried that in a post on Columbus and the flat earth myth Valerie Strauss had preferred the opinions of a mathematician over the expertise of a historian. And in fact, Strauss did prefer the dilettante to the expert. She rejected the historian’s conclusions, which were based in training, evidence, and experience, and relied instead on the opinions of a non-expert, which ignored both evidence and experts. 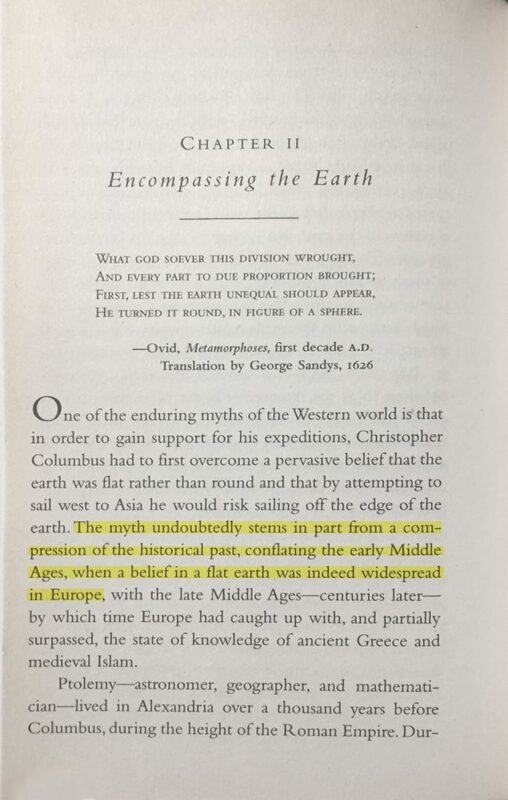 Perhaps because she is awed by mathematics or assumes scientists are smarter than everybody else, Strauss aped the mathematician Robert Osserman’s fantasy about people in the early middle ages believing in a flat earth. Osserman was an accomplished mathematician at Stanford. He was also celebrated for bringing “math to a broad audience.” Turns out, he also happens to have been a flat earther. Osserman too traffics in the flat earth myth. That authority was persuasive. It dazzled Strauss and convinced her to reject the expertise of the historian in favor of the unfounded beliefs of the mathematician. Her preference for the mathematician has, in turn, disseminated the myth yet further, now robed in the authority of a Washington Post column that claims to be grounded in research and to be a resource for teachers and parents. Unfortunately, Strauss has mislead the teachers, parents “(and everyone else)” who reads her column. 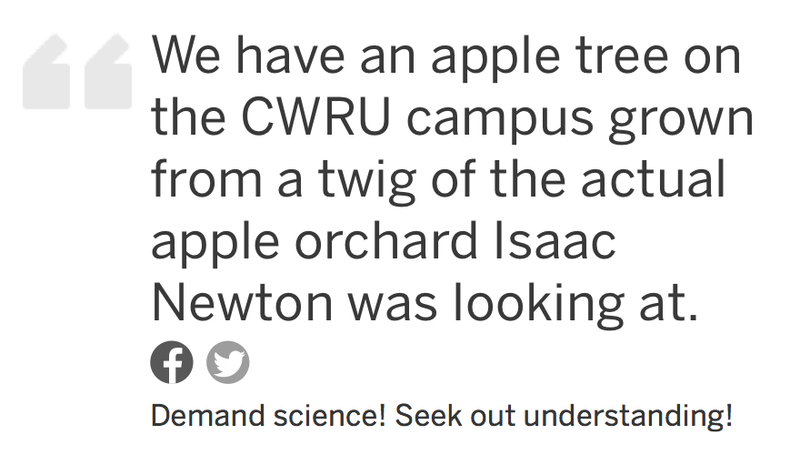 We have an apple tree on the Case Western Reserve University campus grown from a twig of the actual apple orchard Isaac Newton was looking at when he developed his theory of gravity 350 years ago. We’d love for Mr. Irving to come see our tree and look at what we’re doing. Decide for himself if we’re deluded. I cannot understand how this comment about Newton’s apple tree adds anything to their op-ed. Their comment, however, takes scientific relics to a new level. The Institute for the Science of Origins at Case Western Reserve University celebrates its Newtonian apple tree. There is no shortage of Newtonian apple trees. Numerous colleges and universities claim to have an apple tree descended from the “original apple tree grown in the garden of Woolsthorpe Manor:” Cambridge University Botanic Garden; University of Nebraska; William & Mary; The University of York; MIT; etc. Most of these trees are growing in courtyards or gardens associated with physics and astronomy departments, not history departments. 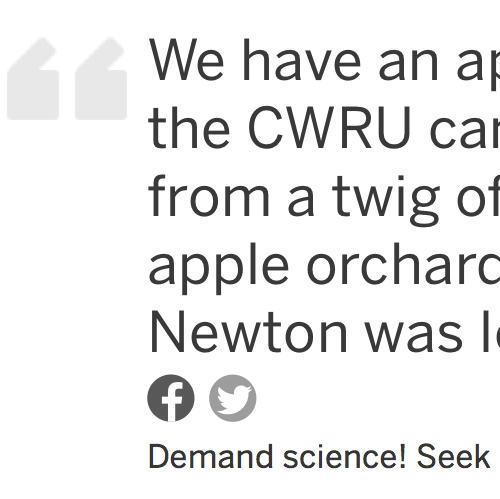 Why, I wonder, do so many science departments want to have and want to celebrate their Newtonian apple trees? I can’t help but see these trees as quasi-secular relics, i.e., as markers of prestige and physical ties to saint-like figures, as means of tapping into archetypal geniuses. As physical artifacts, these relics seem to reinforce hagiographic discovery narratives. The claim to have “an apple tree … from a twig of the actual apple orchard” seems, however, to take the quasi-secular relic a step further. Somehow the spatial proximity is sufficient and important—their tree descends from a tree in the “actual orchard.” Did some occult force emanate from “the original tree” and permeate the entire orchard? How far does the influence from Newton’s original apple tree extend? To all of Woolsthorpe? To all of England? And why emphasize the “actual apple orchard”? As opposed to what, the virtual apple orchard? I just don’t get it. In this case, the twig underscores the myth that Newton was a genius who, in a flash of brilliance, understood the theory of gravity. In this case, the twig is a metonym for a discovery narrative. Although the basic contours of that narrative are familiar, less well known is the process by which that story was established. Conduitt repeated this claim in other drafts of his work. It is unclear how many independent sources there are for these early accounts. Greene refers to Martin Folkes. Conduitt doesn’t cite any source, though he might have heard it directly from Newton—the Conduitts were living with Newton at the end of his life. Pemberton doesn’t cite any source. Voltaire refers to Barton, who probably learned it from Conduitt. So maybe two independent sources, Folkes and Conduitt. 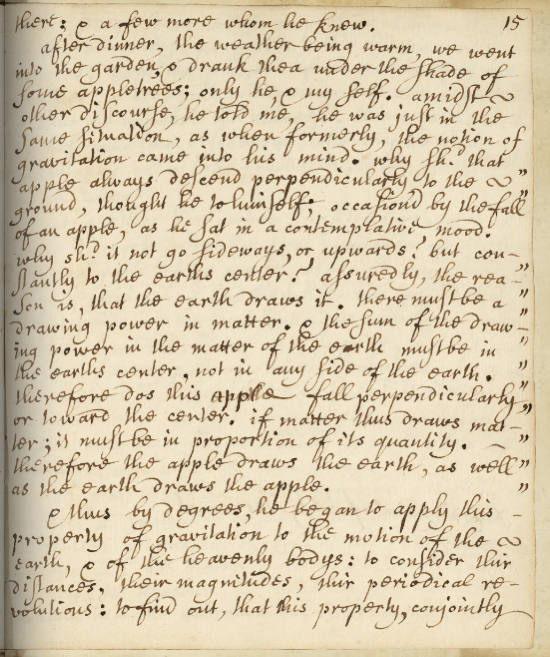 William Stukeley claimed to have heard the story of the apple tree directly from Newton. After dinner, the weather being warm, we went into the garden, & drank tea under the shade of some apple trees, only he [Newton], & myself. Amidst other discourse, he told me, he was just in the same situation, as when formerly, the notion of gravitation came into his mind. “Why should that apple always descend perpendicularly to the ground,” thought he to him self: occasion’d by the fall of an apple, as he sat in a contemplative mood: “Why should it not go sideways, or upwards? But constantly to the earths centre? Assuredly, the reason is, that the earth draws it. There must be a drawing power in matter. & the sum of the drawing power in the matter of the earth must be in the earths center, not in any side of the earth. Therefore dos this apple fall perpendicularly, or toward the center. If matter thus draws matter; it must be in proportion of its quantity. Therefore the apple draws the earth, as well as the earth draws the apple.” That there is a power like that we here call gravity which extends its self thro’ the universe…. We might pause and wonder about this story. There is no record of the story for six decades and then, just before Newton dies, it appears in manuscript and print from people who could have heard it from Newton. Newton was at this time an 83- or 84-year-old man recalling events that happened perhaps as many as 60 years earlier. We certainly have reason to be skeptical of his account. 83-year-old men tend not to recall events accurately, and their narratives tend to toward exaggeration and teleology. Perhaps Newton was the exception—perfect, infallible memory and absolute fidelity to events—though given his experiments with mercury and other chemicals, we would be forgiven for questioning his memory. But we don’t and can’t know that he was. While we can’t confirm the story, its veracity is not its most important aspect. We can confirm, however, that whatever brilliant insight the falling apple produced in 1666, it had no immediate discernible impact on his work. Two decades elapsed between the apple’s fall and Newton’s Principia mathematica , during which time he devoted considerable attention to alchemy and optics, as well as astronomy. Perhaps he fiddled with the mathematics for two decades. 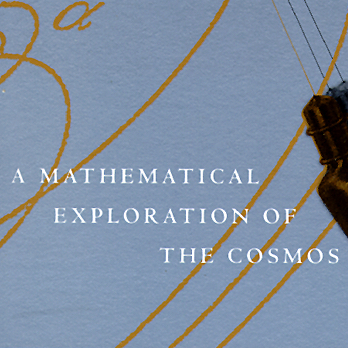 Perhaps he slowly through trial and error worked out the details, struggling to solve new difficulties as he worked to assemble the entire work, slowly working his way toward the system we encounter today in the Principia mathematica . 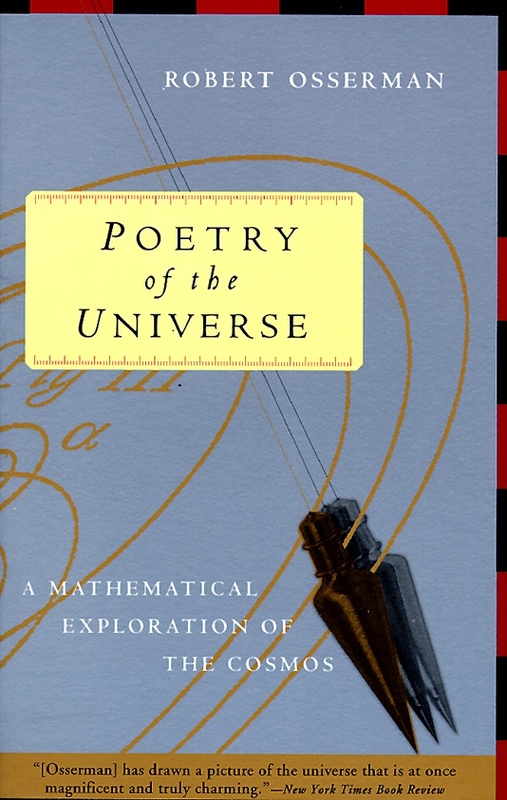 Perhaps, though it seems unlikely, he sat down in some philosopher’s-stone fueled rampage and wrote down the entire Principia mathematica in one frenetic weekend of brilliance and productivity, and then sat on it for two decades. We don’t really know. But highlighting the apple tree story—especially when the best you can say is that your tree descends from a “twig of the actual apple orchard Isaac Newton was looking at when he developed his theory of gravity”—effaces the arduous work, the mistakes and dead ends, the inchoate solutions, the revisions, and the tangible and intangible contributions other people made to bring the Principia mathematica to fruition. While I’m not in Cleveland, I invite Glenn Starkman and Patricia Princehouse to talk to me. I’d be happy to explain historical expertise and history to them. I think we can find a great deal of common ground—and not just because we all struggle to refute the flat earth myth.